How do pollinators drive evolution in flowering plants? 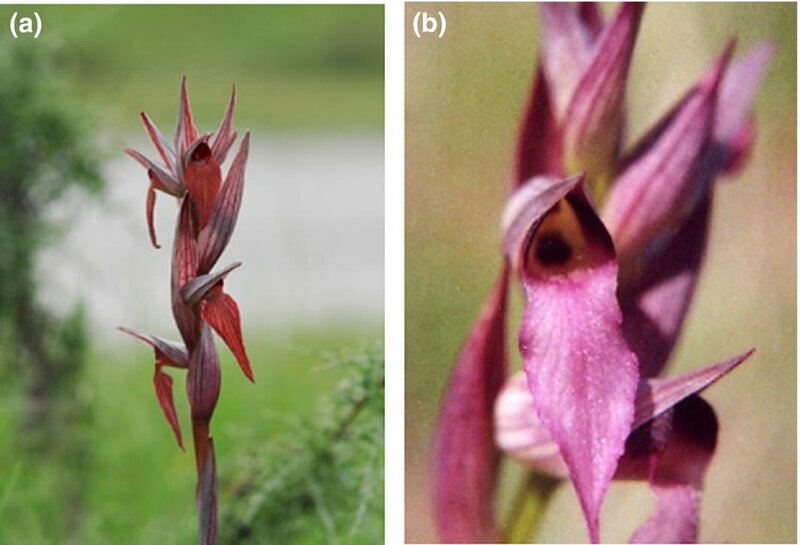 A team from Calabria has investigated a relationship between insects and orchids. What is it about a flower that attracts a pollinator? 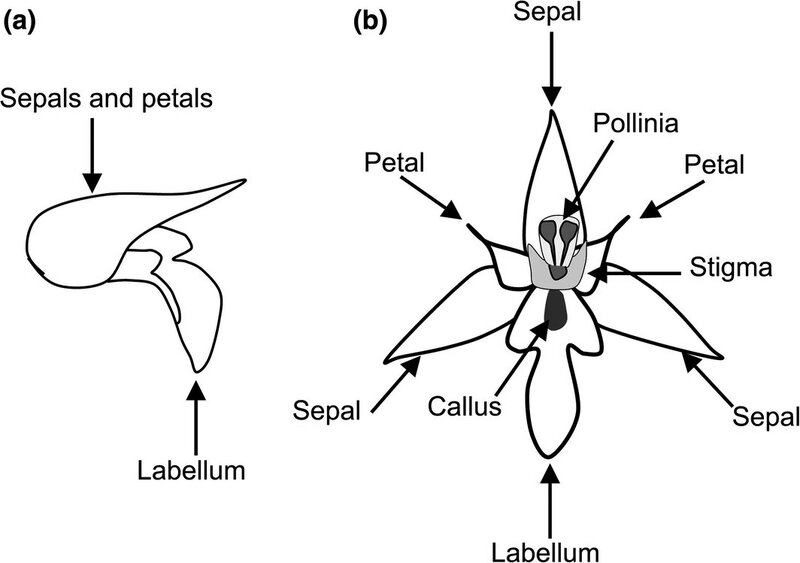 In Functional differentiation in pollination processes among floral traits in Serapias species (Orchidaceae) Pellegrino, Bellusci and Palermo make some alterations to a couple of orchids to see what happens. What they did was make a few alterations to the flowers, either cutting parts, or painting others to see what happened with pollinaria removal and fruit production. This is a technique well-known to readers of Annals of Botany, recently with a study that looked at spur length in orchids. The orchids in question are Serapias lingua and Serapias vomeracea. These are orchids found in the Mediterranean. They both like arid meadows, scrublands and abandoned agricultural environments. While they co-occur, they don’t seem to be in direct competition for pollinators. S. vomeracea offers shelter, and insects can be found sleeping in the tubular flowers at night. This is common to Serapias, except for S. lingua. S. lingua seems to be sexually deceptive. It’s a common tactic in orchids, though not in Serapias. S. lingua attracts male Ceratina cucurbitina, a carpenter bee that is around 7mm long. This difference is interesting, because it suggests there’s something about the flower in S. lingua that’s lacking in other Serapias. An apomorphy, a new evolutionary trait that an organism can pass on their offspring can be a game-changer for a plant. Minelli notes that it means a plant can build new relationships and speed up the process of speciation. What happens if you look for this difference and do something to it? This is a technique that’s been used before. If you chop something away and it has a dramatic effect, then you have found the innovation. On the other hand if you make an alteration and nothing much happens then you may be looking in the wrong place. So to examine these orchids Pellegrino et al. made three changes. In one experiment they detached the petals and sepals to open the tube of the orchid. In another they chopped off the lip of the orchid with scissors. In a third they painted the callus white. The results for S. vomeracea were clear. Alterations to the flower wrecked the reproduction of the plant. For S. lingua it was slightly different. Painting the callus caused the flowers to fail. Removing the labellum hit them badly, only making them 25% successful. But opening the flower actually improved the reproductive success over the natural flowers. Pellegrino et al. argue that typically for Serapias, it’s the visual signals that matter, but for S. lingua, it’s the scent that attracts bees from a distance. It’s only closer to that vision matters and for S. lingua an open flower exposes the callus, giving a clearer target for the bee. It would appear that S. lingua has an innovation that could pull it away from its relatives over evolutionary time.